cab-rank, cab-stand a place where cabs are authorized to wait. Verb intrans. & trans. (with it). Inflected -bb-. Mid-19th century. Travel in or drive a cab. Catching a cab has always felt, and probably always will feel, like something of an indulgent luxury to me. I love that moment at the end of a great evening when you say "Oh let's just catch a cab!" which is, in effect, saying "To hell with the expense! Let's get driven home ... like kings!" Oh yeah. Now that's living. 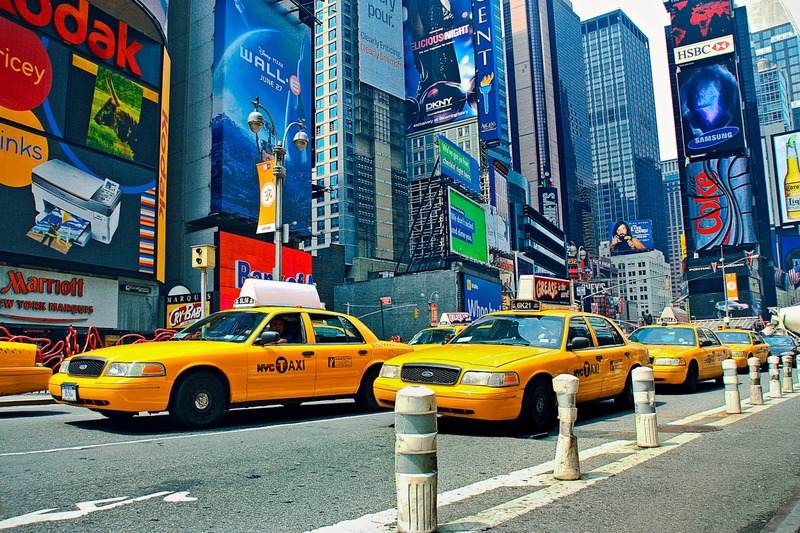 If you've ever wondered about the origin of the word taxi, cab and taxi-cab, it's both quite simple and rather interesting. Taxi is an abbreviation of taximeter, the device that automatically calculates the passenger's fare (invented in 1891 by the German Friedrich Wilhelm Gustav Bruhn if you want to get really nerdy about it). The word taximeter is itself borrowed from the French taximètre and German Taxameter, which came from Medieval Latin for tax or charge, and therefore literally means 'charge meter', which is good because that's exactly what it is. 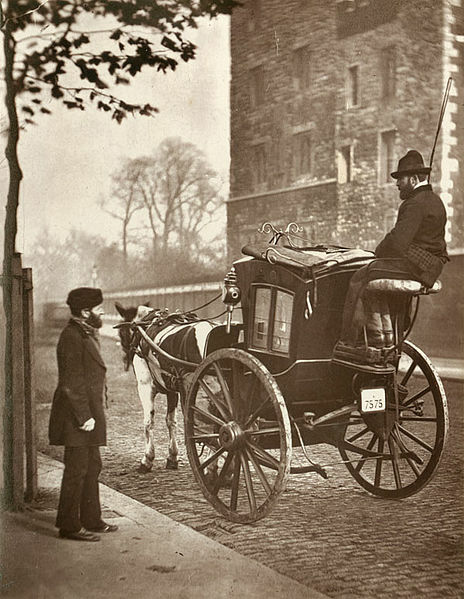 As for cab, this is an abbreviation of cabriolet, a type of horse-drawn carriage that was used as a taxi and later a word applied to early soft-top motor vehicles; taxi-cab is therefore self-explanatory. As for taxis themselves, one should never underestimate the service they provide, and I always feel that a vital part of visiting a new country or city abroad is indulging in at least one taxi journey, especially when the cabs are part of the landscape, as are London's iconic black cabs or New York's yellow taxis. And the local knowledge a good cabbie can provide is unparalleled: a London cabbie, for example, has to have The Knowledge to obtain his licence, which involves memorising 320 routes, 25,000 streets and 20,000 landmarks and points of interest, a cognitive feat so grueling it physically changes the cabbie's brain structure - something to remember when deciding how much you're going to tip. Finally, if you've never got into a taxi and said "Follow that car! ", then you really must. 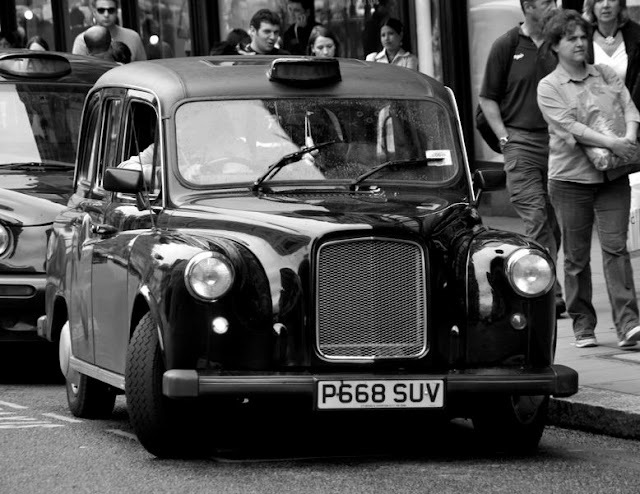 As a fraud investigator, I've had the opportunity to do it on many occasions: cabbies love it, it makes you feel like you're in a movie, and it's something interesting to tell the trouble 'n strife when you get home. Are you, or have you ever been, a cabbie? Have you ever said "Follow that car!" to a cabbie? Do please drop off your fare-minded comments below. Before I started traveling, I think I'd taken a cab less than five times in my life. We drive ourselves in the US, and so I've never gotten over that sense of a taxi as a luxury, like hiring a butler for fifteen minutes. Delightful. They're incredibly interesting! In fact, if I take a cab and the cabbie isn't the chatty type, I feel sorely cheated. I've never said "follow that cab" but once we jumped into a cab in Marrakesh and shouted to the driver in half French half English to get to our hotel before the cab which had just set off before us. The driver thought this was great fun and probably assumed a large tip was at stake so promptly pulled out into 4 lanes of traffic with his foot welded to the floor for the entire journey. That was the last time I've been genuinely worried for our safety in a car. It was a 1970s Peugeot with 1970s brakes weaving in out between trucks, buses, countless motorbikes, donkeys, other heat crazed taxis. He drove straight through three sets of red lights clearly enjoying the race and being given a chance to show off his "skills". It was fun, and there was a thrill to ordering a cab to follow and overtake that car but never again. That does sound like fun, although you've kept enigmatically quiet as to why it was so important that you beat the other cab ... ? I can't believe you didn't link to this song by the almighty mister Lenny Kravitz. I've only once been inside a cab/taxi in my whole life. That was in Spain, with a couple of friends, to travel from the Loyola airport to some trucker hotel outside of town. First we had to ask multiple cabbies if they felt like driving us there (apparently, "outside of town" also means "outside of working area"), and when we finally found one, the driver was super quiet. To be honest, our Spanish was mediocre at best (me being the only one with "some" knowledge of the language), so even if he tried having a convo with us, it'd have been a very short one. Loyola... Bibi you stupid runt. Valladolid, duh. And sounds like it was a pretty darn good story... except for the non-chatty cabby. We don't really have a taxi-culture in Belgium. Public transportation is too well-organised, you can get almost anywhere with train, tram, or bus. Well we have a public transport system in Ireland, too, y'know Bumblebee "Everything's Better in Belgium" Bibi. Oh yeah - except it's rubbish. Well fortunately we have lots of cabs too. Oh ... but they're ridiculously expensive. And, Bibi, I must say we often seem to have a similar taste in music - great song. Of course it is, it's by His Royal Majesty Lenny Kravitz. Efficiency is one of the best traits to look for in drivers when calling for a Cab service in Kandy. With personnel who understand the meaning of punctuality at your call, you will never again be late for any appointment.